The Rev. 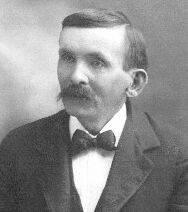 Edmund McGinnis (32), the father of Rev. David Allen McGinnis and a circuit rider in his own right, was born on November 25, 1798 and moved to Texas nine years before his death in 1865. He said that he was first convicted of sin when he was about six years old. He moved west with his parents to Guyandotte in 1811, when he was 13. He was converted four years later at a camp meeting on the Guyandotte River. Tradition says he met his wife while doing religious work in Ohio and they were married in 1821. Twice a day he prayed with his family, besides having private prayer alone. Edmund was licensed to exhort in 1822, and licensed to preach at a quarterly Methodist Episcopal meeting at Adam Black's on August 11, 1827, five years after his son David was born. He began riding and preaching on the Logan circuit in 1828, the first of seven circuits he would travel during his lifetime. It was hard work. Edmund preached the first Methodist sermons in the West Virginia counties of Logan, Raleigh, Fayette, Wayne and Braxton, where his circuits were located, and in many other places. In 1834 he gave bond to celebrate the rites of matrimony, taking an Oath of Allegiance to the Commonwealth of Virginia. An earlier West Virginia Methodist preacher covered 3,000 miles in one year, visited 400 churches and was paid $12.10. Edmund was a farmer and storekeeper too, and after about 1840 his son David Allen McGinnis filled up the rest of his father's ledger book with his own journal. 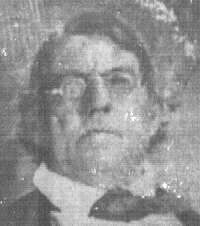 Cousin Herbert McGinnis repeatedly made the odd claim that Rev. 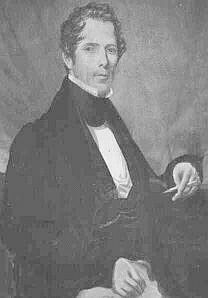 Edmund McGinnis once owned 9,000 acres where Huntington, WV now stands (it may have been his uncle Edmund, the legislator) and that along with the Beuhring family he gave part of it for the campus of Marshall College. Edmund received a 144 acre land grant west of "Guyandotte Source." He bought Lot 13 in Guyandotte for $600 in 1838, and sold it for $1050 in 1840. But by 1854, they had divested themselves of even the property they had inherited from John Hoagland, and owned no more land in Virginia. They moved to Texas in 1856. 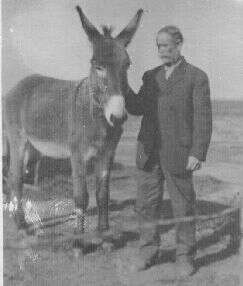 The 1850 and 1860 Censuses list him as a farmer even in his fifties and sixties. Except for his eldest son David Allen McGinnis, who resisted all pleas to join him, all of Edmund's surviving children came to Texas in the 1850's, including Oliver, Melville, Fletcher and Melcena. After Edmund had arrived in Texas in 1856, he wrote a letter to his son David Allen McGinnis,"We left Virginia on 29 April 1856, with an eight day layover in New Orleans which made the trip 20 days 8+12=20 We came by water by (via) New Orleans & thinse acrofs the Gulf to Galveston on board of a ship from there we took a steamer up the Buffalow Bayou to Harris Burgh there we took the steam car for Richmond a distance of 30 miles then stage 60 miles which brought us in 6 miles of Olivers.... cost $40 each = $120." Edmund was pleased with his decision to relocate to Texas. He described his property, "...800 acres at $1750... back 20 acres fenced... peach trees... good well..."
"The land I have here is rich and good enough for me..."
Three years later, Edmund wrote to his ailing daughter Melcena, still in Virginia, advising her "to come to this country if possible it mite save your Life.... you speak of your pretty home in your letter to Oliver and so it is But then my dear child think of that home above that Lieth 4 square where we shall not need the Light of a candle for the glory of God will light in it and those that are saved shall walk in the light of it think then of the mansions above and Let not your heart be troubled for this is not our home here we have no continuing city But should seek one to come then think of meating your Little ones there enjoying the shady bowers above How hapy you all will be then where parting is no more." He continued, "This world is all a fleeting show nothing sure But heaven there fore lay all up on Gods alter and concecrate yourself to him and be assured you have the prayers of a Father & Mother that Loves you..."
On March 5, 1865, Edmund became ill while preaching his last sermon five miles from home, and the sickness lingered for months until he died on June 9, 1865. At the last, he told his family that he was dying happy, gave his hand to everyone present, and told them, "Be good and serve God and meet me in heaven." In his will, he left his theological books to his son David. His wife Polly died eleven years later. His gravesite is unknown, but it is probably in Fayette County since his wife and sons apparently didn't move north to Polk and Liberty counties until after his death. Descendants of his children Melcena, Fletcher and Melville still live in Texas, including Pat Marburger, Pearl Brack, Sandra Vega and Peggy Pike Gordon, among others. Like his father Edmund, Melville Louis McGinnis was a farmer in Cabell County in the 1850's, where he married his wife Elizabeth Green Gould in 1849. He continued to farm in Fayette and Liberty counties after coming to Texas in 1856. He was 23 years old, with two small children, Arden Brazilian and Alice Proctor. Elizabeth was already pregnant with their third child, Harwick Horton. Three months after their arrival, Melville's father Edmund wrote "The neighbours has bin verry good to Melville." Though his younger brother Oliver predicted in 1854 that he would be rich in five years, Melville still owned $2,000 worth of land both in 1860 (Fayette County) and 1870 (Liberty County). Melville's orphaned niece Fannie Beuhring lived with them in 1870. Melville's orphaned grandson Willie Jefferson, was raised in Katy by Enoch Marsh McGinnis after his mother Harriet's death in 1909. Enoch and his son Rex had contact with Melville's daughter Alice and granddaughter Libbie Muckelroy. As newlyweds in 1850, Edmund's son Oliver Asbury McGinnis and his wife Helen lived in a Cabell County boarding house owned by Lormsteph Limmons. A sheriff, Oliver acquired 90 acres on Four Mile Creek in West Virginia in 1853. But before his marriage, he had fought in the Mexican War where he got the "Texas fever". In an 1854 letter he encouraged his family to join him in striking it rich on Texas land deals. In fact, according to Cousin Herbert, bad land deals in Texas wiped Edmund out financially. But by 1860, Oliver owned $12,352 in real estate and $3,255 in personal property in Fayette County. Oliver later fought for the Confederacy in the Civil War, and by 1870 in Polk County, he owned $1,000 in land and $6,000 in personal property. In 1870 his twenty-year-old niece Nora Beuhring was living with him. Family legend says he may have fled to Cuba later in his life. 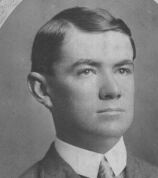 He died in 1914, leaving McGinnis, Epley, Perkins and McNess descendants behind. Fletcher McGinnis was only nineteen when his family moved to Texas. His father Edmund wrote that he killed 15 deer in the three dry months since they came from West Virginia. He married Fannie Hager, also from West Virginia, a year later. A farmer, he struggled harder to make a living than his brothers. In 1870 in Liberty County, with five children at home, his property totaled only $1,300. His widowed mother lived next door. He served in the Confederate States Army. In October 1866, he and his mother had sold land in Fayette County to Frederich Ladewig, at the same time Melville sold his land to William Pagel. When his son George died, he helped raise his grandchildren, teaching his grandson George "Shine" McGinnis how to hunt and fish. 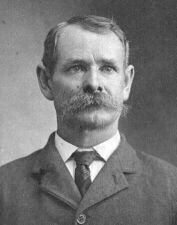 Fletcher died in Liberty County in 1915 and is buried at Oak Shade Cemetery near Tarkington Prairie. His descendants intermarried with the Isaacks, Beshell, Vann, Richards, Coleman, Simmons, Howard and Hockersmith families. In October 1847, Melcena McGinnis, in her late teens, received her first letter from a wealthy German widower, George Frederick Louis Beuhring, asking if he might visit her. They were married on February 23, 1848 in Cabell County, WV. After her husband's death in 1859, Edmund and Polly had urged her to leave her "pretty home" and move to Texas for her health. Melcena did move to Fayette County, Texas after her husband's death of tuberculosis, knowing she had contracted the same disease. She died within a year, but was able to leave her five small children in Edmund and Polly's care before her death. Later the children lived with other McGinnis relatives in Texas. Her husband's family in West Virginia seems to have cut her off. Her will was dated February 25, 1860. 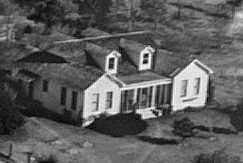 Though tradition says she is buried in Boggy Creek Cemetery, hard investigation failed to locate the cemetery, let alone her grave. However, Boggy Branch is between Round Top and Winedale. Melcena's descendants included the Bolins, Graham, Barkers, Manrys, Mebanes, Wests, Wiggins, Pikes, Arnolds, Harrells, McCanns and Mings. Mary Elizabeth "Polly" Hoagland (33) was born in 1797 in Williamsport, WV and began to seek God's favor at an early age. As a 14-year-old student at Marietta Academy (now Marietta College) on the Ohio River, she boarded with a Presbyterian family. One Sunday she wanted to attend the Methodist meeting and asked where they met for worship, but the family refused to tell her. She said she would follow the sound of the church bell then, but they told her the Methodists had no bell. "Then," she said, "I will go and stand in the street and wait till someone comes along who looks like a Methodist, and I will follow that one to the house of God." Some women came by, dressed plainly and wearing very plain bonnets. "These," she said to herself, "are Methodist; I will follow them." They led her to a prayer meeting in a kitchen, where she gave her heart to God. When Polly returned home for school vacation, she asked her father Cornelius Hoagland if they could have family prayer. Receiving his approval, she prayed with them regularly for some time. Finally her father told her he thought she should "better not pray any more in the house," so she began to pray in the garden after nightfall, sometimes until she fell to the ground exhausted. Her worried parents would search for her, and after several occurrences, her father told her to go back inside to pray. As a result, most of her family came to know God. When a Methodist preacher was asked to speak at a neighbor's housewarming, he invited Polly to pray after the sermon. According to the story, "she commenced in a low, feeble tone of voice, but soon her prayer began to go up and up until it reached the throne of God, and power from on high came down upon the people; sinners fell to the floor and cried for mercy, and many found peace with God," including the owner of the house, who gave up whisky and declared that he was "going to start for heaven this very night." Once at a camp meeting, Polly fell to the ground under the powerful blessing of God and lay there as if she were dead. A skeptic at the meeting thought she was pretending, since her eyes were still wide open. But when a fly landed on her eyeball without causing it to move, the unbeliever declared, "This is no hypocrisy." He was converted and later traveled as a Methodist preacher. 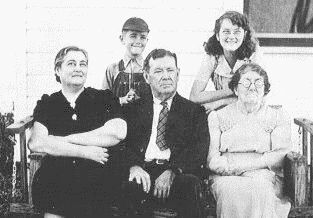 After Edmund's death, Polly and her sons moved to Liberty County, where she lived next door to Fletcher. On March 9, 1871, 73-year-old Polly wrote a letter to her son David Allen McGinnis and to some of her grandchildren that, "I am abel to work and write a little though I feel quite feeble and often cough verry hard and suffer much yet the hope of heaven bears me up and I hope to live a while longer and want to groe better... Arden [another grandson] profest religion four hours before he died and talked to all present and bid them farewell and died praising the lord so we are all fast passing away... Mary and Samantha, Adorn the profeshion you have made and walk in the footsteps of the righteous and write when you can and pray often." 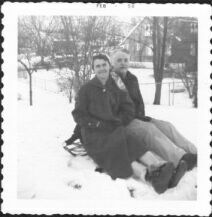 She concludes with a note to 13-year-old Enoch Marsh McGinnis, saying, "My dear little grandson I was glad to hear from you be kind to all and fear and love God with all your heart and write again and tell Parmenias to write to me." Polly McGinnis died July 6, 1876, apparently of tuberculosis.